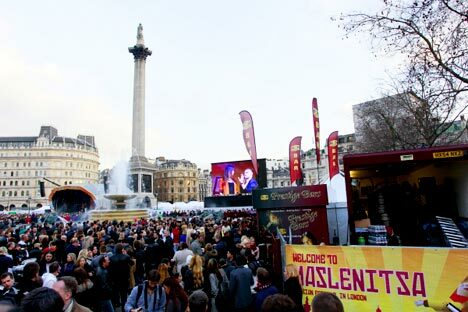 Russian expats in London joined with citizens of the British capital and tourists alike to listen to Russian music and sample blini as the Maslenitsa festival took over Trafalgar Square. On Feb. 26, for one very merry afternoon, London spoke Russian. And it did so very well. Nostalgic Russian expats, curious Londoners and mesmerized tourists gathered in Trafalgar Square, at the very heart of the British capital, to bid farewell to winter and salute the arrival of spring in accordance with a centuries-old Russian tradition: Maslenitsa (Butter Week). Maslenitsa, originally a pagan festival later incorporated into Christian traditions, coincides with the last week before Great Lent, the 40 days of fasting observed in anticipation of Pascha (Easter) in Eastern Christianity. For the Orthodox believers, Maslenitsa is the last occasion to celebrate and indulge in those joyful activities and games that are not deemed appropriate during the somber fasting season. Even today, Maslenitsa remains one of Russia’s most celebrated holidays, observed with devotion and a fair amount of blini, the typical Russian pancakes that are consumed in abundance throughout this week. Celebrating the final Sunday of Maslenitsa in London has become a tradition that always surprises. The idea of reserving one day for the flourishing Russian community of the city was first proposed under the administration of then-Mayor of London Ken Livingstone in 2005, and evolved into the Russian Winter Festival. This was replaced by Maslenitsa under the Mayor Boris Johnson in 2009, and moved from Potters Fields Park to Trafalgar Square in 2011. Both events were organized by Ensemble Productions, a company specializing in the promotion and organization of cultural events both across the UK and abroad. But it was on Sunday that the pure spirit of Maslenitsa reached its full potential. Attendees couldn't have asked for more appropriate weather for the holiday celebrating the arrival of spring. A bright sun shone upon them for the entire afternoon, and a few sparse clouds at sunset offered a spectacular view of the city from the steps of Trafalgar Square. Children dressed in traditional Russian costumes twirled and swirled among the crowds, stopping only to dive their noses in powdered sugar on top of their blini. It was almost too idyllic. In fact, there was tight security to prevent any disruption of the event. News reports later emerged that members of the Russian opposition group in London Govorite Gromche tried to add some political flavor to the event, and were denied access to the festival. Andrey Sidelnikov, the leader of the group, was arrested on the premises and held at the police station for several hours, according to a statement he posted on Facebook. In the same statement, Sidelnikov also commented that his group was in Trafalgar Square merely to celebrate the event by distributing air balloons, whistles and white ribbons to the people and children in the square. The real attraction was on the main stage, where comedian Vyacheslav Manucharov, Pushkin House Director Julian Gallant and Yulia Arshavina (wife of soccer star Andrei Arshavin) presented a colorful music and dance show. The Folk State Academic Pyatnizky Choir, which this year celebrates its 100th anniversary, was a real crowd-pleaser, with its Russian folk dances and songs. Other highlights included pop group In-Yan and the Ensemble Ulger, which fascinated the spectators with its original throat singing technique from the Siberian steppe. Later in the afternoon Valery Syutkin with his Syutkin Band entertained the viewers with an interval of blues and rock'n'roll. One of the best moments of the show was the link-up with the official celebrations in Moscow. Visitors were able to sample (somewhat overpriced) Russian food, buy souvenirs and handicrafts and amuse the kids with specially designed games and activities at the Children's Marquee. For those with no prior relationship with Russia, the event was a crash course on the country's culture and society. Irene, a first-time Masenitsa-goer, was particularly impressed with the proportions of the event. "It seems to be very popular, I cannot believe how many people are here," she said. Her sister Sonia, who studied Russian in college, rejoiced in the opportunity to immerse in a Russian environment : "I really enjoyed the atmosphere, the music and that so many Russians came along. It was fascinating to see the contrast between being at the heart of London and yet enjoying a truly Russian experience." Maslenitsa was also an occasion to do some good. Top model and special ambassador for the event Natalia Vodianova took the opportunity to launch a Maslenitsa-related initiative in support of the Naked Heart Foundation, a charity that she founded in 2005 to help underprivileged children. Visitors to the event were invited to purchase a T-shirt decorated with a recipe for healthy blini to support the charity. As the event came to a close, the composed and serene atmosphere that had dominated the first part of the event was replaced by euphoria and camaraderie. With the majority of tourists already gone and, possibly fueled by a few too many shots of vodka, more and more people seemed to abandon any embarrassment and launched themselves in frantic dances and passionate sing-alongs. As more than one Russian in London would tell you, Maslenitsa is the only occasion they have to meet up with family and friends and make Trafalgar Square their own.